through Netgalley in exchange for a fair and honest review. When I saw the ad for this ebook on Netgalley, I requested it, as it was about wildlife and was set in Montana, a state I still needed to cover for my US challenge. And now I see Atria is preparing to publish it, so looks like it’s doing well. I’m glad, as it really deserves success. 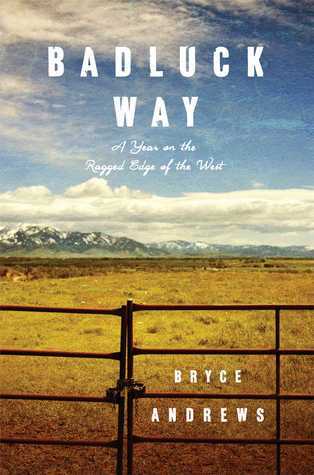 After a heartbreak and a succession of meaningless small jobs, Bryce decides to spend some time as a ranch hand at Sun Ranch, in the high country of South West Montana, over the border from Yellowstone. Though a city kid, he had always been fascinated by the West since he visited a ranch at age 7, and went back to it every summer for 10 years. The book consists in describing his daily life on the ranch in the company of the ranch manager and other employees. Believe me, it’s much more fascinating than it would seem at first sight: I learned a lot about how to care for the cattle amid many predators, with the need even sometimes to spend the night outdoors near the cows!, about the necessary job on fences, on how to provide for water for the animals, etc. But Badluck Way (name of the gravel track leading to Sun Ranch) is first of all about transformation and complications. In his daily struggle to protect the cattle, especially against wolves, Bryce will be led to do something that will change him for ever. The style is breathtaking, with awesome descriptions of colors in nature, of the mountains, the sky, the constant wind, the land, and the wild, and of man in it, with real feelings of awe, that is, fascination and fear. There are lots of animals around. Apart from cows and horses, I noted: bear (grizzly), mountain lions, wolves, deer, jackrabbits, elk, antelope, moose, sheep, coyotes, badgers, and as for birds: hawks, eagles and blue grouse. Many chapters end with a special section focusing on the central drama between man and wolf, narratives sometimes coming from the perspective of the wolf itself, if I understood correctly. If you care for nature and beauty, I highly recommend you to read the book. But be aware there are also some gruesome graphic descriptions of animals killed by wolves. The ranch was at the vanguard of a movement to rethink the way agriculture is practiced in the West. When a person works long enough on a ranch, he comes to suspect that most of the living things that walk or grow on the hills and pastures are either with or against him. James and Jeremy understood ranching as the art of protecting one’s chosen creatures in a brutal world. Mine might have been a simple, pretty story, if not for the wolves. In late July, they emerged from the foothills . . .
where he manages a conservation-oriented cattle ranch. 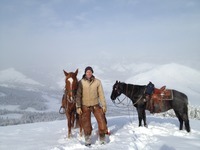 Big Sky Journal, Camas Magazine, and Backpacker. WHAT IS YOUR FAVORITE NOVEL SET IN MONTANA? This entry was posted in ebook, Non-Fiction, Quotations, Reading Challenges and tagged Bryce Andrews, Montana, ranch, wolves, Yellowstone by WordsAndPeace. Bookmark the permalink.